Figure 10-141 shows a giant retinal tear. A large area of bare choroid is visible through the break. progressive constriction of the peripheral fields and eventually blurred vision. 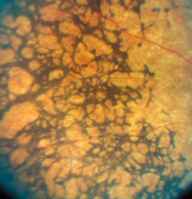 Evaluation of the retina reveals the very characteristic picture of black ''bone spicule'' pigmentary changes, particularly in the midperipheral retina. 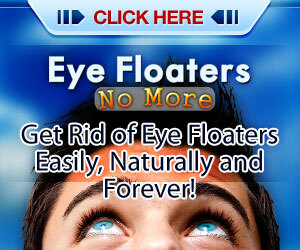 Macular degeneration occurs in late stages. No treatment is available. 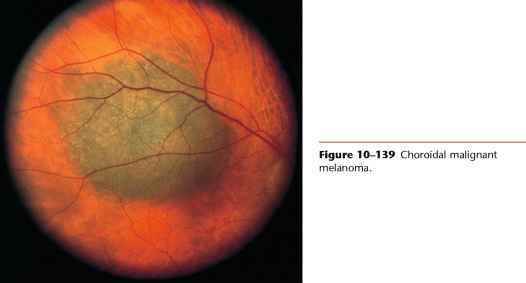 Figure 10-142A is the classic picture of retinitis pigmentosa. A close-up photograph of the ''bone spicules'' is seen in Figure 10-142B. A staphyloma is an outward bulging of the sclera and protrusion of intraocular contents at a point where the sclera is too thin to support the ocular structure. When present in the posterior pole, as shown in Figure 10-143, it is associated with degenerative high myopia. 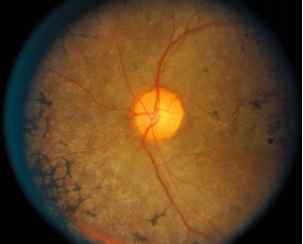 Macular holes, retinal tears, and retinal detachment are common. Staphylomas may be congenital or may occur after trauma or chronic inflammation that has weakened the scleral wall. In most cases, no therapy is available. 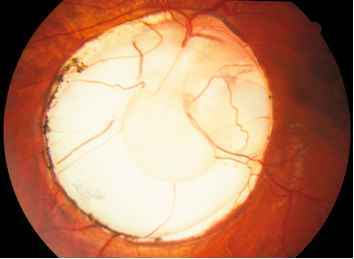 In severe cases, the staphyloma gradually enlarges and enucleation is eventually necessary. 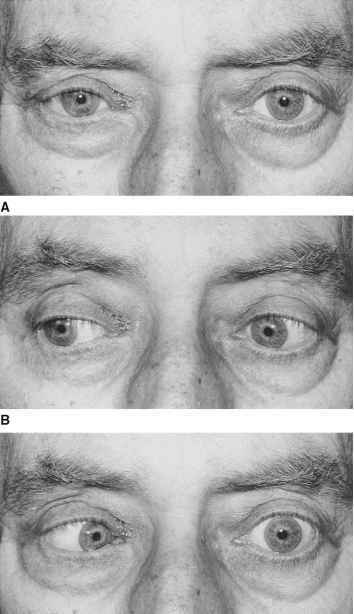 Abnormalities of gaze are not uncommon. Ophthalmoplegia is paralysis of the eye muscles. Lesions causing this paralysis may be acute, chronic, or progressive. The abnormalities of this condition are demonstrated in Figure 10-144. When the patient is asked to look straight ahead, the right eye is abducted. Notice the ptosis of the right eyelid. When the patient is asked to look to the far right, both eyes move normally, although the right ptosis is well seen. When the patient is asked to look to the far left, the right eye cannot cross the midline. This patient has an acute oculomotor paralysis secondary to a fungal lesion near the nucleus of the third cranial nerve. Figure 10-144 Acute right oculomotor nerve paralysis. 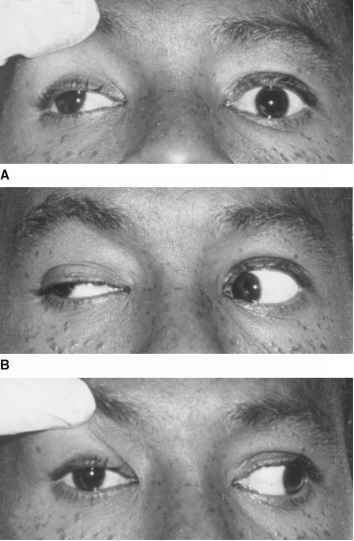 A, When the patient is asked to look straight ahead, the right eye is turned laterally (note the position of the corneal light reflexes). The right palpebral fissure is markedly narrowed, requiring the eyelid to be elevated to visualize the position of the eye. B, When the patient is asked to look to the far right, both eyes are able to move in that direction. Note the marked ptosis of the right eyelid. C, When the patient is asked to look to the far left, the right eye cannot cross the midline.